In my Facebook group this week, someone asked how to get rolling with a student blogging project, and it took me back through my blogging adventures. I started my first blog back in 2008, to document my adventures with my husband living and teaching abroad in Bulgaria. I was stunned by just how easy it was to pop my travel photos and stories into the blogosphere so that my family back in the U.S. (and quite a lot of other people too, as it turned out), could follow along. In fact, it was so easy that I started three more while I was there. One about learning to cook in Bulgaria, one for my I.B. English students who were constantly missing class, to give them updates and link their assignments, and one with my tenth graders to share their choice reading recommendations with the world. Oh, and I started a blogging elective and had all my twelfth graders create their own writing portfolio blogs as well. Did I mention I got pretty into the whole blogging idea? No sooner did I learn what a widget was than I was off to the races. And that’s what I want for you too, because blogging is SUCH A GREAT option in so many different educational scenarios. In this post and podcast, I’m going to give you a really quick introduction to my favorite simple platform, and then walk you through a bunch of ways to use it. Blogs are an amazing way to empower students to share their own ideas with the world. First, the quickest possible technology primer. Starting a blog on blogger is SO EASY. Follow the steps below to get started. 1. Set up a Gmail account or sign in to yours. 3. Choose the type of profile you want to use and then click "Create New Blog." 4. Put in a title and web address that fit the topic you've selected. You might want to choose one of the "simple" blog templates and to begin with. Then click to create your new blog. 5. Click "no thanks" when you see the offer to connect a domain name. This is for professionals who want to remove the ".blogspot" from their web address. 6. You can now click "view blog" on the left, or "new post" in the center. 7. From within "view blog" you can always click "new post" in the upper right hand corner, or "design" to adjust the look of your blog. 8. Inside "New Post" you can type the content of your post. The bar above your writing field will allow you to put in images and links, as well as adjust the look of your text. 9. Inside "design," you can click "layout" and then adjust the look of your blog by adding elements to your sidebar or dragging elements around. If you have any trouble, you can watch a complete video tutorial right here. I'm also going to jump on in my Facebook group this week and do a demo video of my own, as well as answer questions. I'll link to the video post as soon as it is up. OK, I'm about to share SO MANY fabulous ways you can empower your students to channel their voice and creativity into blogging. But first, one quick word of warning and one quick word of comfort. The Warning: Don't let your students put any personal or school information on their blogs! Nothing beyond first names. This is an important security measure for you to stress with them. The Comfort: Students can handle the tech. Remind them they can always Google "how to embed sound clips in Blogger," " how to speed up an iMovie video," etc. I first assigned students to create podcasts eight years before I learned to record one myself, and it was fine. Really. Let students go farther than you with technology if they want to. 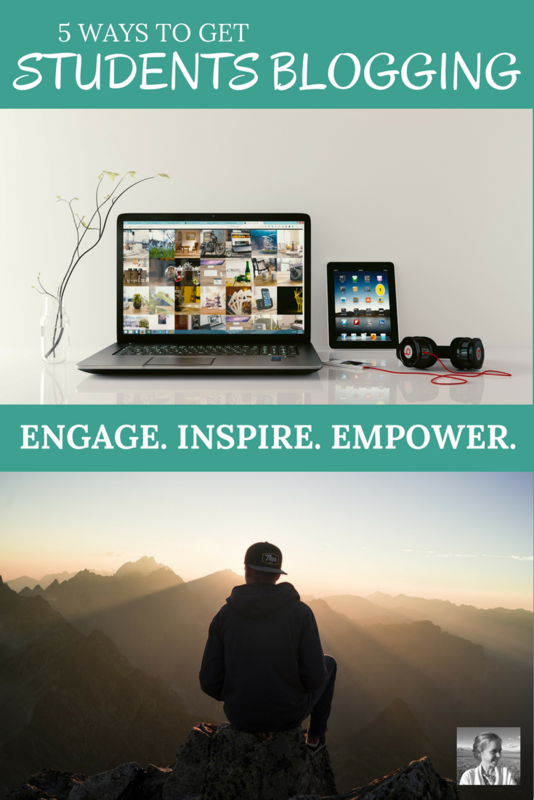 When they ask if they can add the new things they find and discover they can make to their blogs, just say yes! One great option for using blogs in class is to let students start a blog on any topic that interests them. It really doesn’t matter what they hone their skills writing on, as long as they care about it. They could choose fantasy football, fashion, gaming, celebrity pets, graphic novels, local news, figure skating, Instagram trends, etc. You can incorporate student choice blogs into your routine in many different ways. You could create a two-week stand-alone unit. You could work on the blogs every Friday for the entire year, as a 20% time option. You could introduce them in the first week of school and then assign posts as independent work once a month. Whatever format you choose, just keep introducing a new type of blog work to do. Have them write an opinion post, a list post, a linked post, a media post (embed a video, podcast, slideshare, etc. ), a feature post, etc. You can also use class time to have them comment on each other’s blogs. For this reason I recommend you create a class blog where you can link to all the students' blogs. That way they can easily access everyone’s. All you have to do is set up your blog and create one post, in which you type the title of each student's blog, highlight the text, click "link" and put in their web address. 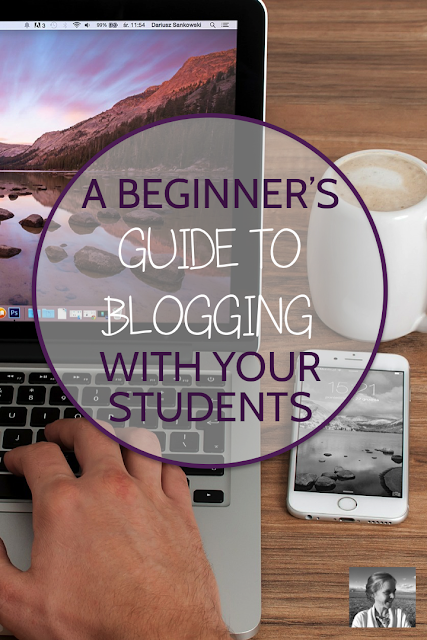 Once you publish this post, you and your class can visit anyone's blog in seconds. You can share work on your projector and have the class give feedback that way as well. I did student choice blogs as an elective several years ago, and the students loved it. Each of them was absolutely fascinated by their own little online world, devoted entirely to their most passionate interest. If you're a bit busy right now prepping for exams, building your classroom library, convincing your administration it's OK to use creative methods in class, learning about escape rooms, giving extra help, advising various clubs, and everything else generally heaped on a teacher's plate, you can find my brand new full curriculum packet for choice blogging right here. Depending on the educational technology available at your school, a class blog can be a very handy thing to have. 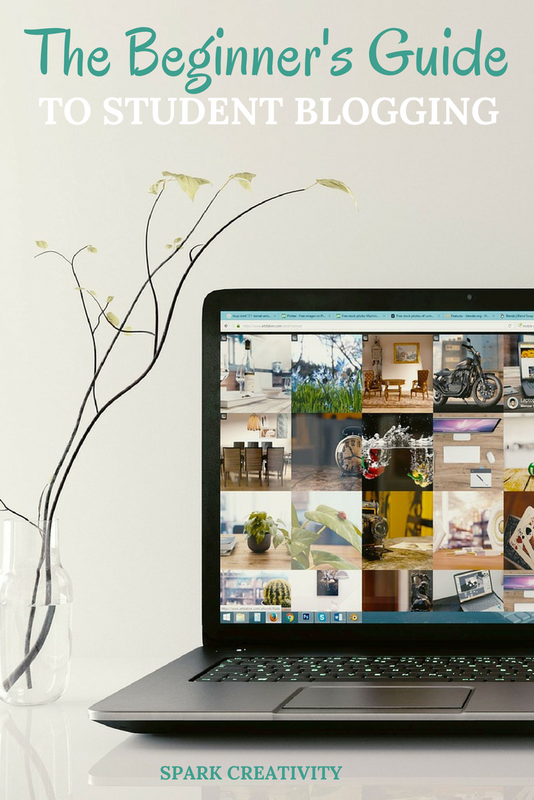 A class blog can allow you to share photos of events with students and their families, make announcements, and also put up short summaries of class activities and links to assignments in Google docs. I once had a class of seniors in which three or four students seemed to miss every day. I simply could not keep up with gathering all their work, explaining individually to them everything they had missed, and reminding them to make up assessments. Yet our school had no system for this. That's why I started my I.B. English 12 blog. In five minutes a day, I would make a post that summarized what we had done, linked to any online resources we used or videos we watched, and linked to the handouts and homework on Google Docs. When students returned from absences, I just reminded them they needed to keep up with the work via the blog. They didn't even need to wait until they returned to school. What a lifesaver! It really saved my sanity. I heard Jennifer Gonzalez from the Cult of Pedagogy do an episode this year on curation projects, and I loved it. In a curation project, students share a variety of work around a theme and knit it together with their introductions and commentary. Kind of like if they were creating a museum exhibition with a variety of artistic pieces and multimedia. Each piece would be captioned with the important information that ties it into the exhibit as a whole. A blog is a perfect option for this type of project. Let's say you want students to do an interdisciplinary project that knits together what they are learning in history with what they are learning in literature. Have them choose a connecting theme and curate poetry, photography, videos, radio clips, etc. on the theme. You can choose a number of blog posts for them to make and the types of elements you wish to require. Link all the project blogs to your class site so that you can have students go on a virtual gallery walk as the project comes to a close. They can comment on each other's blogs as a way of sharing feedback, or you can project them one by one and let a few students share what they like about each. I once had my students design blogs for the title character of Jane Austen's Emma. It was great fun for us all to imagine what Emma would write about in her blog, what she would link to, what images she would share. Would it be a dating blog? Fashion? Advice columns? Life lessons? Through the project guidelines I was able to guide them to use their blog to show their knowledge of the character and her motivations and interests. 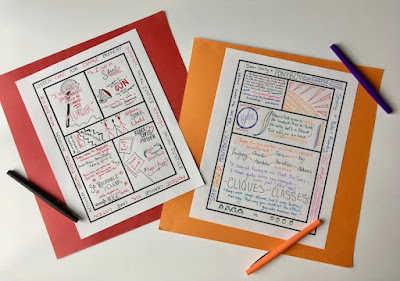 It's important to construct your assignment carefully so that students keep their work connected to the text. Then, just let them know the requirements as to number of posts and sidebar features, and you are off to the races. This one takes us outside the classroom realm, but it does impact teaching quite a bit. Starting a blog for yourself, to reflect on your professional practice and join the online community of teacher writers, can be a really helpful way to process what you are doing and get perspective on your classroom. It can also be a good outlet when things are hard. When I was first writing my travel blog from Bulgaria, I was able to turn many an awkward moment into a funny blog story, and soon I found myself constructing my posts in my head while stuck in difficult situations. It made them much easier to handle! Writing about your professional practice on a blog also puts you on a track toward publishing articles about your teaching to share with others and presenting at conferences. It can help you further your career as well as reflect on your own journey.